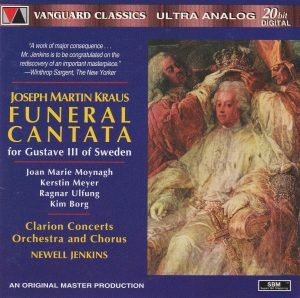 Joseph Martin Kraus’ dates (1756-1792) make him an exact contemporary of Mozart, integral with the untimely death at the age of 36 (of tuberculosis), one year and ten days after Mozart (he was his younger by a mere five months). He was born and trained in Germany but his compositional career really started in full in 1781, at 25, when he entered the service of the enlightened King of Sweden Gustav III after three years spent in Sweden in dire conditions, vying for recognition. Gustav even sponsored Kraus on a four-year training tour of Europe, from October 1782 to the end of 1786 – the ancient regime version of J. William Fulbright, I call it. As for Gustav, he was kind of the Swedish Lincoln or Kennedy, not because he abolished slavery or stood up to the Russians (although, for the latter, he did, to regain the Baltic provinces, but only after having allied with them to conquer Norway) but because of his assassination (and Gustav is famous for providing the model of Ricardo in Verdi’s Ballo in Maschera, derived from Auber’s Gustave III ou le Bal masqué). In fact Gustav is a highly controversial figure, an enlightened despot, admirer of Voltaire, who cut down the powers of the parliamentary nobility (the Brits and the French would have chopped his head off after a mock trial, and had he been a Roman some 1700 years earlier, his own son would have stabbed him), legalized Catholic and Jewish presence in Sweden and lavished a lot of money on the arts. No wonder then that Kraus wrote his Funeral Cantata to his memory: one puts one’s art where one’s mouth is, the French call it “la reconnaissance du ventre”, “the stomach’s recognition”. Himself died a mere nine months after his patron, an admirable case of a servant’s faithfulness to his masters, considering what I pay my cleaning lady by the hour, I doubt that she will do the same for me. 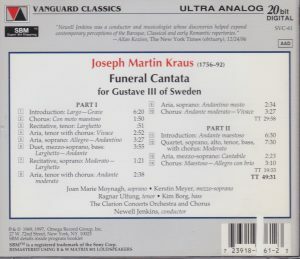 30 years after the commercialization of the CD, nothing is rare anymore, although Kraus and his cantata is far from an abudant presence on CD: I’m aware of two other recordings, one from 1988 conducted by Stefan Parkman on Musica Sveciae MSCD 416, which I’ve reviewed, and a recent recording on Deutsche Harmonia Mundi, “Begrabniskantate”, by L’Arte del Mondo, barcode 888837645423, which I don’t have yet, but there is a long way to go before it reaches the recorded status of Mozart’s Requiem. But when this recording by Newell Jenkins leading the Clarion Concerts Orchestra and Chorus came out on Vanguard in 1969, it was even rarer and I believe a recording premiere, and it’s good to have it back on CD, in this reissue from 1997, although it too has become rather rare now on the open market. It’s a powerful work, and, yes, Mozart’s Requiem comes to mind at times, with a long, somber and brooding orchestral introduction (6:15), explosive opening chorus (track 2), furious tenor aria that could almost be Tamino running away from the snake in Bergman’s Swedish-sung Magic Flute (track 4), passionate soprano aria (track 5) that could be Konstanze in Entführung (without the fiendish vocalises) torn between two loves, a mezzo aria (track 6) that could come from… Gluck’s Orfeo. Etc. The Cantata is sung in Swedish, and Vanguard imported three out the four singers from the Stockholm opera, and not just anybody: mezzo Kerstin Meyer, tenor Ragnar Ulfung and bass Kim Borg. They are all perfect. Only soprano Joan Marie Moynagh is American-born. I can’t judge the quality of her Swedish acent, but her vocal delivery is great, a great dramatic soprano, the stuff for the furious arias of Dona Elvira or Dona Anna, to make me wonder why she didn’t make (apparently) a greater career. The Clarion chorus sings valliantly. I don’t have the more recent version on Deutsche Harmonia Mundi for comparison, but compared to Stefan Parkman and his small-scaled period-instrument forces and lower pitch on Musica Sveciae, Jenkins leads an incomparably more powerful and dramatic rendition, and with marginally to significantly better singers. Great transfers, fine sound, liner notes by Newell Jenkins himself, English translation of Swedish lyrics provided, LP-tailored TT of 49:30, but I’m not complaining.